Doing tasks in groups are deemed to make everything easier as there are a lot of people working together to achieve a certain goal. When working in groups, it is also considered that you will be more productive and that you will also be able to finish everything way earlier than expected. But how do you actually know if working with groups is effective? 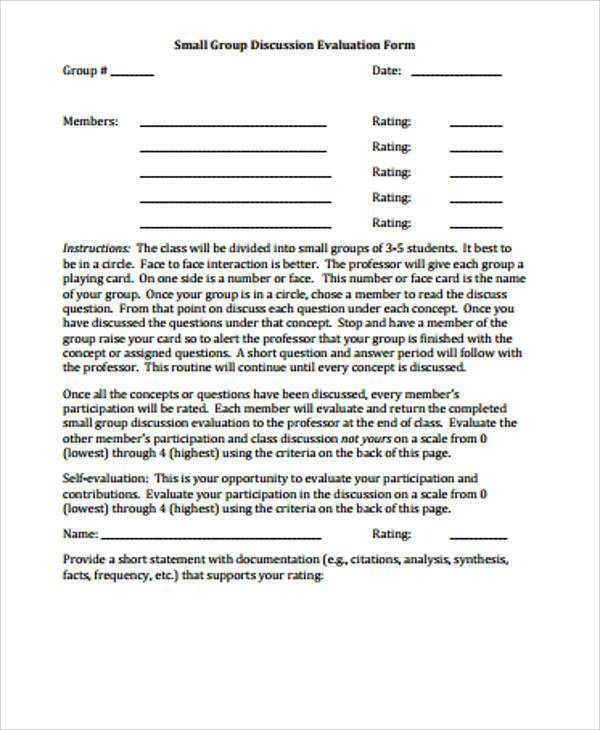 This is where group evaluations come in handy! 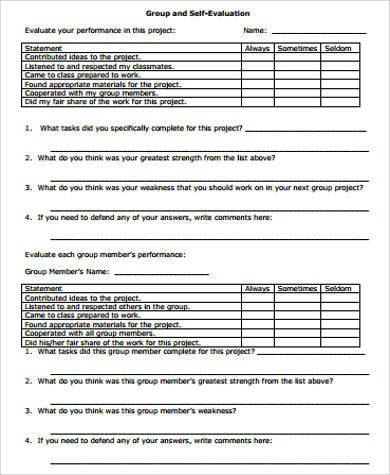 Conducting a group evaluation is way more efficient than doing the traditional evaluation where you would be the one to do it. 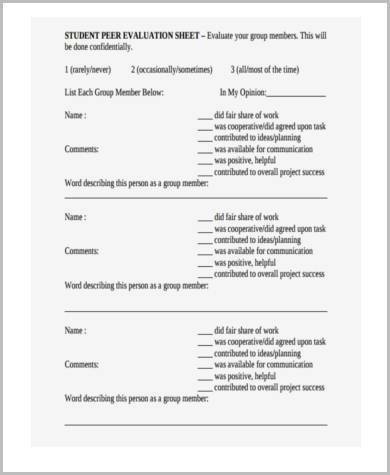 With group evaluation, you are sure to save a lot of time and effort. 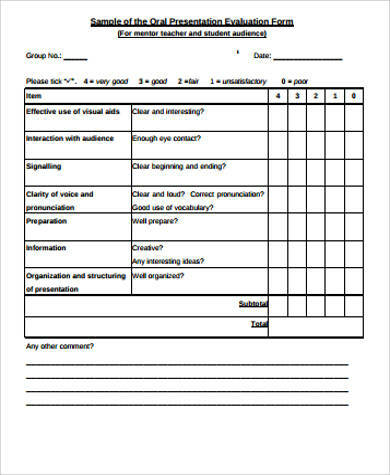 However, you might find yourself a bit confused about conducting group evaluations and how your evaluation forms should look like. We are here to help you out! 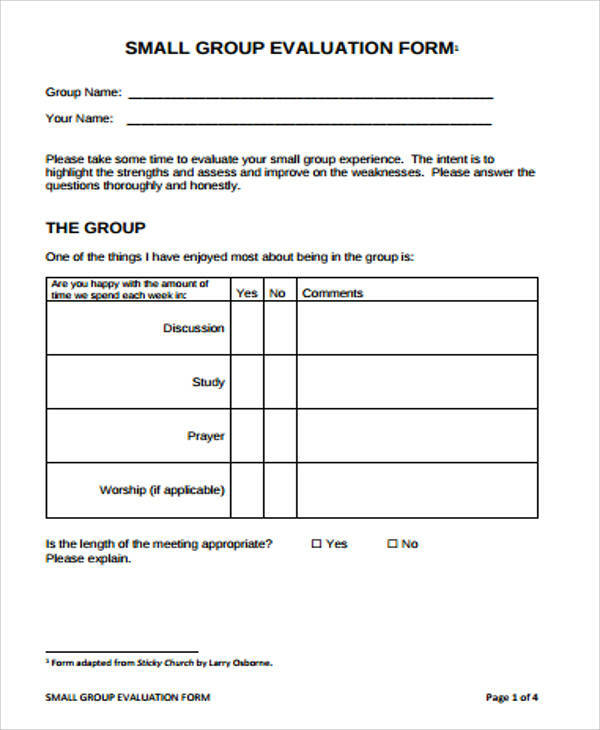 We even have a few sample forms for you to choose from and use as reference. They all come in PDF file format which is easy to copy to a word text editor and modify as your very own evaluation form. 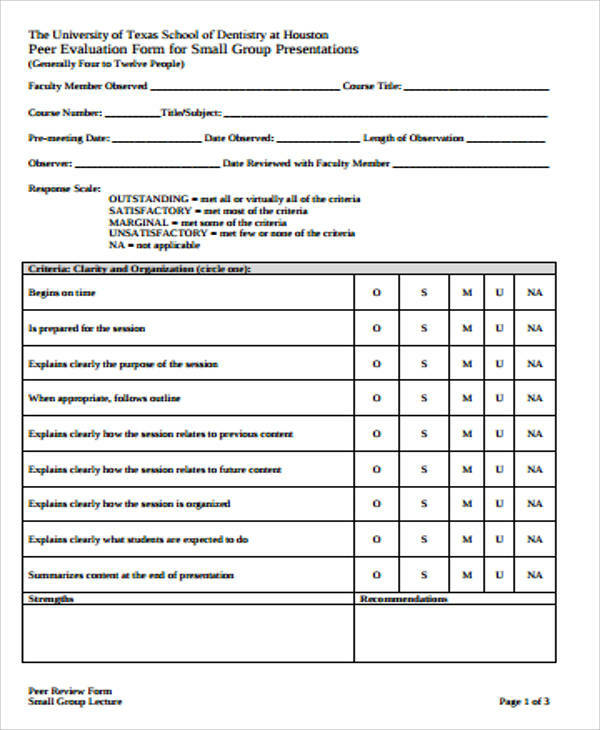 Plus, files in PDF format do not get messed up when opened, which makes them great references for when you are making your own group evaluation form from scratch. 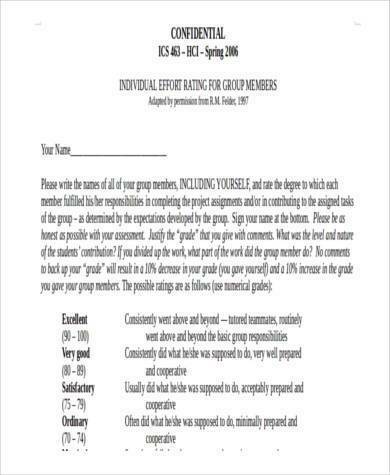 So are you ready to find out more about group evaluations and the forms that come with them? Keep reading this article and you will surely learn a lot! So what is an evaluation? An evaluation is used by a wide variety of industries to determine the worth and significance of subjects based on standard criteria that are used. It is a means of interpreting and giving meaning to certain results in a structured manner. It can either be summative or formative—the former is conducted while a study is ongoing while the latter is conducted when the study has already been completed. 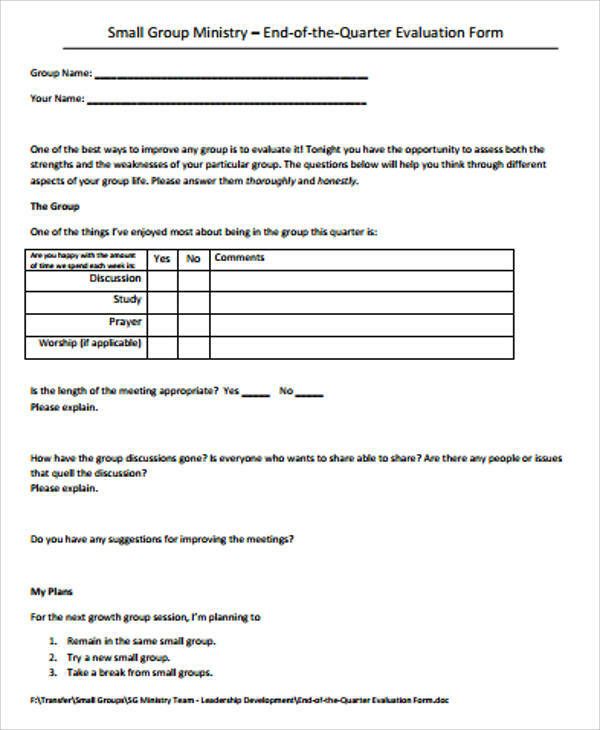 What Is the Purpose of Group Evaluation? help expedite the delivery of outputs once all the necessary group adjustments have been done. 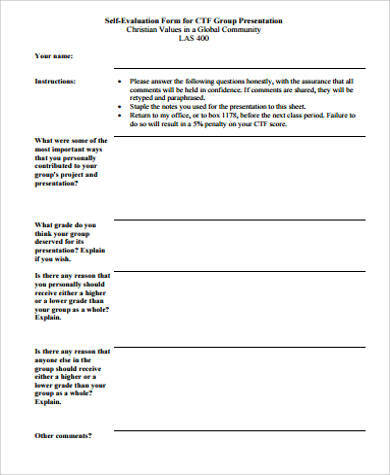 What Questions Can You Ask in a Group Evaluation Form? You can add more questions and be more specific depending on what the current circumstance is. 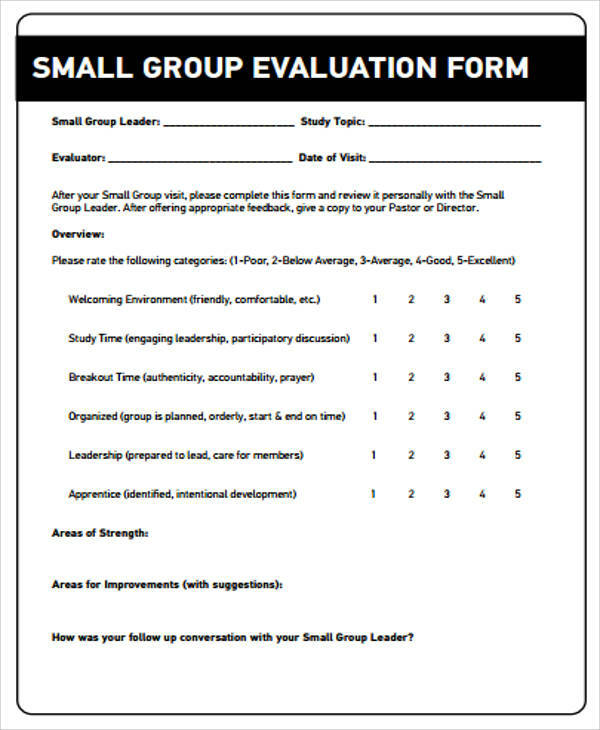 Small group evaluations can be conducted anytime. You may want to set a schedule regarding when you would like to do the evaluation. You can do it annually, twice a year, or every quarter depending on what works for the groups. 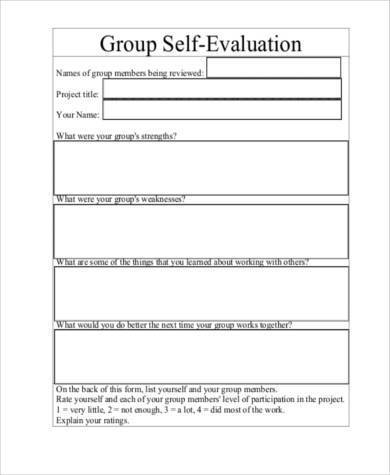 Ideally, the people involved in the group or group self-evaluation should be given ample time to reflect on their experiences regarding working with a group especially if you want to get the best results from the evaluation. 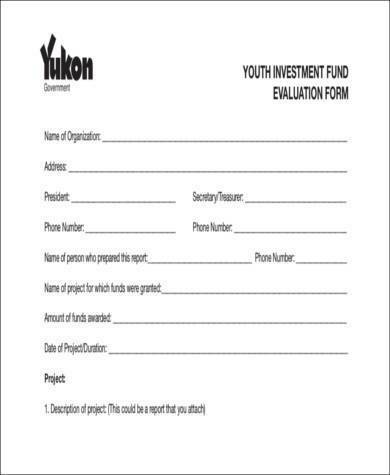 It will also be a good idea to let the participants know what the purpose of the evaluation is. It is very important that this is discussed thoroughly before conducting the evaluation. To ensure that you are able to conduct evaluations properly and smoothly, you may follow the tips that we have for you below. 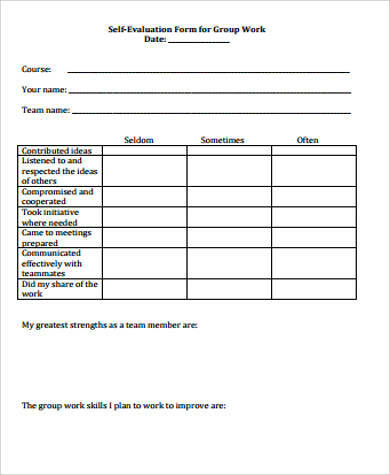 One good way of seeing if the group performance is going well, you have to evaluate each member of the group. When each individual is evaluated, they become more motivated to do better and to correct their mistakes as soon as possible. If you provide a checklist sample for the member to use as a reference if they have done their tasks accordingly, the evaluation will be more efficient. 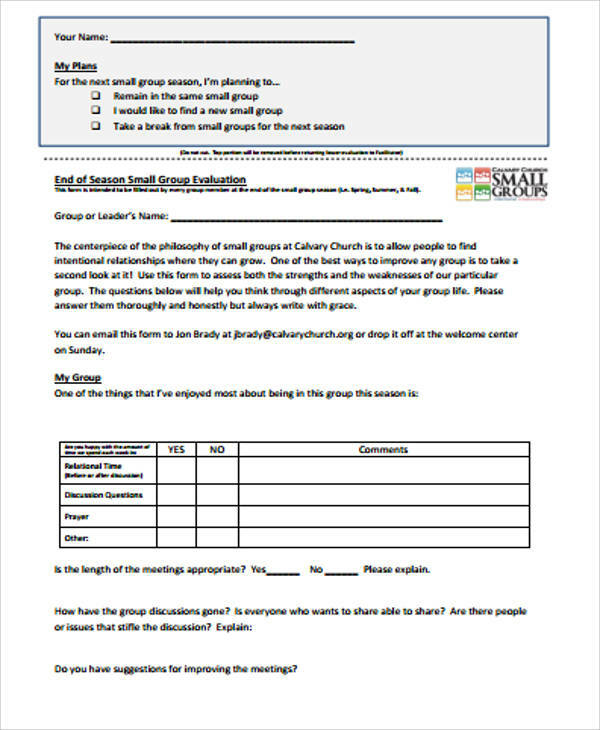 You can provide text boxes in your evaluation forms where the members can give a few short statements about their experience. You may also conduct simple interviews to probe deeper into the experience of the individual. You can save a lot of time. 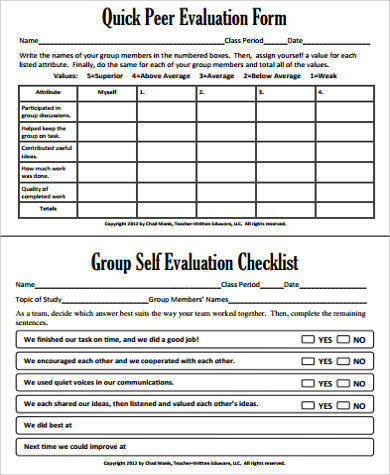 Instead of doing the evaluating, the participants do the evaluation by evaluating each other and the group as a whole. This proves to be more efficient as you now need not do the evaluation on your own. It will be easier to pay attention to things that need thorough attention. Since the evaluation is done by the participants themselves, there will be no bias coming from you as the facilitator. Knowing what the strengths and weaknesses of your study will be much easier. You can gain helpful insights from the participant. Participants do not only help you know what the strengths and weaknesses of your study are but they can also give you a couple of suggestions that would help you to make all of the necessary improvements needed. Encourage learning from one another. 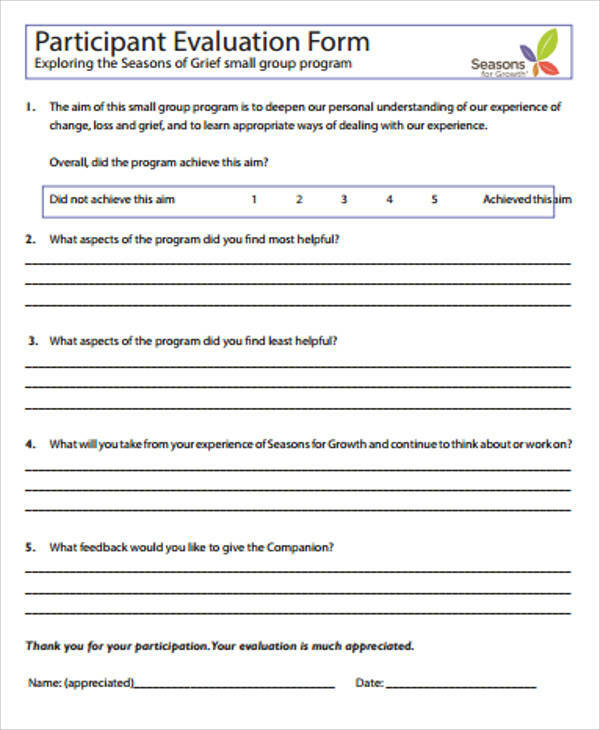 With peer evaluations and group evaluations, you can help the participants learn from each other’s experiences. With that being said, it will help them work with each other better and more efficient. The more these evaluations are carried out, the healthier the relationship between the participants become. As we have said at the beginning of this article, we have prepared a few sample evaluation forms for your convenience. You might be wondering how you can get a hold of the high-quality samples that we have for you. It is quite simple and will not take so much of your time. Keep reading to find out how. Go through the evaluation samples we have uploaded. 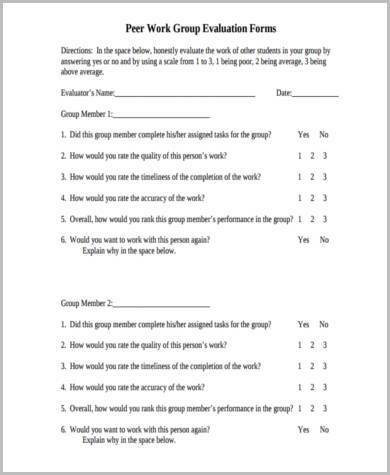 Choose which ones are a good match for your purpose of using a group evaluation form. Once you have chosen the template or templates that you want to use, click on the DOWNLOAD button that can be found on the right side of each sample. You will notice that you will be asked to VERIFY first. The DOWNLOAD button is now a VERIFY button that you will need to click after you fill out the text box with the given captcha. Double-check for errors before you click on the VERIFY button. Once you click on the VERIFY button, it will now be a DOWNLOAD button once more. Click on it and you will be prompted to save the sample or samples on your device. Save the sample/samples you have chosen with a file name of your choosing. See how simple that was? 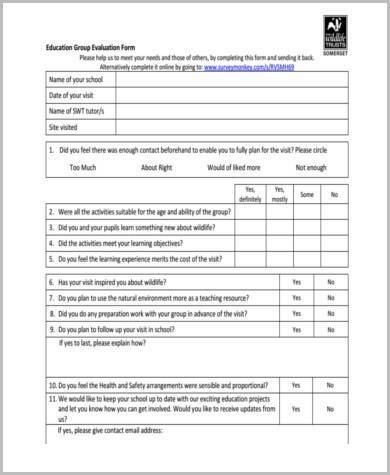 Now you can get started on your group evaluation form!